Cook pasta as directed on package omitting salt and adding broccoli for last 2 minutes of cooking; drain. Rinse with cold water to cool; drain. 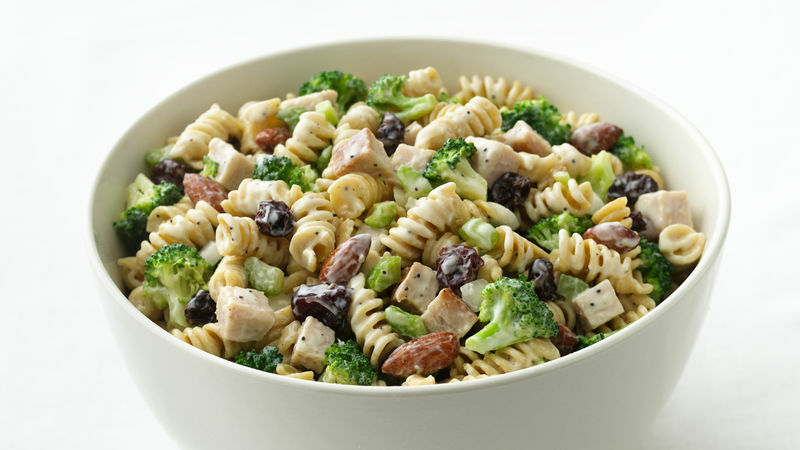 In large bowl, mix pasta, broccoli and all remaining salad ingredients except almonds. In medium bowl, beat dressing ingredients with wire whisk until smooth. Add to pasta mixture; toss to mix well. Cover; refrigerate at least 2 hours to blend flavors. Before serving, stir in almonds. *To toast almonds, heat oven to 350°F. Spread almonds in ungreased shallow pan. Bake uncovered 6 to 10 minutes, stirring occasionally, until light brown. If the salad is a bit dry, just stir in 1 to 2 tablespoons fat-free (skim) milk before serving. Dried cranberries can be substituted for the cherries—also, if you really like poppy seed, go ahead and stir in a little extra. 75% less fat • 46% fewer calories • 46% more vitamin A than the original recipe. Smart substitutions brought down the fat and calories and broccoli was added for more nutrients.